The Kingdom is inside of you, and it is outside of you. When you come to know yourselves, then you will become known, and you will realize that it is you who are the sons of the living Father. Thomas the Apostle, also called Doubting Thomas or Didymus (meaning "Twin," as does "Thomas" in Aramaic), was one of the Twelve Apostles of Jesus. He is most famous for questioning Jesus' resurrection when first told of it, then proclaiming "My Lord and my God" on seeing Jesus in John 20:28. The person old in days will not hesitate to ask a little child of seven days concerning the place of life. 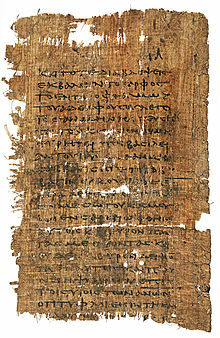 The author of the Gospel of Thomas discovered at Nag Hammadi in 1945 is unknown, but is identified in the text as Didymos Judas Thomas, and this is generally regarded to be Thomas the Apostle. It consists primarily of sayings, said to be those of Jesus, with a few framing anecdotes associated with some of them. I have cast fire upon the world, and see, I am watching over it until it blazes. I am not your teacher. Because you have drunk, you have become intoxicated from the bubbling spring that I have tended. Whoever blasphemes against the Father will be forgiven, and whoever blasphemes against the Son will be forgiven, but whoever blasphemes against the Holy Spirit will not be forgiven either on earth or in heaven. He who knows the All but fails to know himself lacks everything. I have cast fire upon the world — and behold, I guard it until it is ablaze. This heaven will pass away, and the one above it will pass away. The dead are not alive, and the living will not die. Thou art like a philosopher of the heart. When you make the two one, and you make the inside as the outside and the outside as the inside and the above as the below, and if you establish the male with the female as a single unity so that the man will not act masculine and the woman not act feminine, … —then shall you enter the Sovereignty. Within a person of light there is light, and he illumines the entire world. When he does not shine, there is darkness. Unless ye fast from the world, ye shall not find the Sovereignty; unless ye keep the entire week as Sabbath, ye shall not behold the Father. I found them all drunk, I found no one among them athirst in his heart. And my soul was grieved for the sons of men, for they are blind in their minds and do not see that empty they have come into the world and that empty they are destined to come forth from the world. His disciples say to him, … when will the New World come? He says to them: That which you look for has already come, but you do not recognize it. Behold the Living-One while you are alive, lest you die and seek to perceive him and be unable to see. Your rulers and your dignitaries are those who are clad in plush garments, and they shall not be able to recognize the truth. Whoever has recognized the world has found the body; yet whoever has found the body, of him the world is not worthy. Why do you wash the outside of the chalice? Do you not comprehend that He who creates the inside, is also He who creates the outside? The Sovereignty of the Father is like a woman who is carrying a jar full of grain. While she was walking on a distant road, the handle of the jar broke, the grain streamed out behind her onto the road. She did not observe it, she had noticed no accident. When she arrived in her house, she set the jar down—she found it empty. Whoever has found the world and become enriched, let him renounce the world. Woe to the flesh which depends upon the soul, woe to the soul which depends upon the flesh! Logion 10 has a parallel in Luke xii. 49, but with a change of emphasis. The canonical version looks to the future: "I came to cast fire upon the earth, and how I wish it were already kindled!" In Thomas the fire has been kindled: "I have cast fire upon the world, and behold, I guard it until it is ablaze." A similar saying in Luke 12:49 is clearly eschatological. "I came to cast fire on the earth, and how I wish that it were already kindled." Thomas changes future to past and present. The fire has been ignited, and Jesus keeps the world until it burns up; to be near the fire is to be near Jesus and the kingdom (Saying 82). Thomas, because thou hast seen me, thou hast believed: blessed are they that have not seen, and yet have believed. 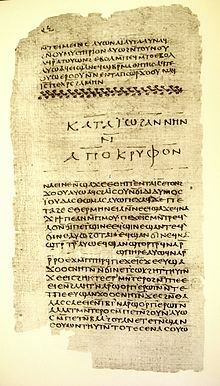 Logion 10 has a parallel in Luke xii. 49, but with a change of emphasis. The canonical version looks to the future: "I came to cast fire upon the earth, and how I wish it were already kindled!" In Thomas the fire has been kindled: "I have cast fire upon the world, and behold, I guard it until it is ablaze." This raises an interesting problem in relation to the common source of Matthew and Luke, since Matthew (x. 34) records a saying, "I came not to cast peace, but a sword." As already observed, something like this appears in logion 16, but in the saying in Thomas "division" and "fire" are paralleled in Luke, "sword" in Matthew. The question is whether in Thomas we have a conflation of the two synoptic versions, or a form of the saying derived from an independent tradition. This page was last edited on 16 April 2018, at 16:10.